“THERE’S A MAGIC here,” says co-owner Margie Christoffersen. El Coyote, one of the city’s most venerable and beloved Mexican restaurants, is honoring its 85th anniversary this month with 85-cent menu specials and a daylong celebration, replete with giveaways, a Mariachi band and cake on Sat., March 5. 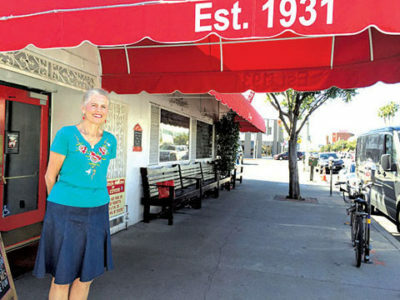 On that date in 1931, Blanche and George March opened the original restaurant at First Street and La Brea Avenue. Twelve years later, El Coyote moved to its current location at 7312 Beverly Boulevard. An integral part of Los Angeles culture, generations of Angelenos have shared El Coyote’s classic Margaritas and signature cuisine while celebrating birthdays, anniversaries, showers, marriage proposals, divorces and even wakes within the festively decorated rooms and patio. Celebrities from John Wayne to Kate del Castillo and from Kevin Spacey and Jay Leno to Jessica Simpson and even Princess Grace have been spotted at the candlelit tables. Currently owned by the Marchs’ nieces Margie Christoffersen and Barbara Buser, with Margie’s son with Wayne Christoffersen serving as general manager, the 90-person staff turns out approximately 1000 meals a day. The restaurant’s friendliness, value and commitment to pouring a fair drink make it a favorite with locals and visitors alike. Throughout March, El Coyote is offering 85-cent pizzas and tortilla soup, and on March 5, a taco or cheese enchilada with rice and beans will be available for 85 cents (dine-in only limitations apply).